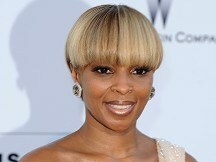 Mary J Blige has revealed she'd love to record a duet with Tom Cruise. The Grammy-award winning hip-hop singer has collaborated with Bono, Diddy and Prince, and stars alongside Tom in the new film adaptation of musical Rock Of Ages. Mary told E! News about recording a duet with Tom: "If he asks, absolutely!" She gushed about the film, saying: "You guys are going to be blown away. He is insane... he became a rock star. He sang like one, he moved like one, he talked like one. He made us scream when he walked past us." Tom stars as bad boy rock star Stacee Jaxx, in Adam Shankman's adaptation of the Broadway musical. Paul Giamatti plays his manager, Mary plays nightclub owner Justice and Alec Baldwin, Russell Brand and Julianne Hough also star in the love story set to 80s rock ballads by acts including Bon Jovi and Journey. Mexican soap heartthrob Diego Boneta has been cast as the aspiring young rockstar Drew. He revealed: "Seeing Tom perform on the stage, that's not something that you can learn. "Rock star comes from within and Tom had it. With preparation and a lot of vocal lessons and all that, he pulled it off. He's Axl Rose. It's really incredible." Grammy- and Oscar-winning singer-songwriter Melissa Etheridge, a breast cancer survivor, has received a Hollywood Walk of Fame star. Rihanna got her marching orders after a farmer objected to the pop star peeling off her clothes while filming a new video on his land. The Scissor Sisters have revealed Lady Gaga insists on staying at the cutting edge of style behind closed doors. Chart-topping act One Direction are to play a number of arena shows as part of their first headline tour.